Is This Politician Insulting War Vets? It all began when Conservative MP Bev Oda resigned her position with the Harper government. The disgraced Minister of International Cooperation was responsible for a series of scandals that including being the first sitting cabinet minister to be found in contempt of Parliament, extravagant use of taxpayer dollars and repeat performances defying the law by smoking in her parliamentary office. Her eventual departure from politics spawned a by-election in the Ontario riding of Durham and all eyes across the nation are now fixed on the candidates vying to become her replacement. Campaigns kicked into high gear for this second chance to win the public’s support and federal Liberal Grant Humes has managed to generate controversy amid the excitement. As his election sign was revealed on social media leading up to Remembrance Day, it generated negative responses from veteran families the candidate wasn’t expecting. Facebook followers of the campaign page shared their criticisms ranging from “offensive” to “publicity stunt,” “classless” and “shameless as stealing a poppy box.” A concerned Afghanistan vet voiced disapproval and others indicated they would not vote for Humes as a result of this material. Part of the problem was confusion about the sign itself. The candidate’s name does not appear and it seems to be an invitation to a patriotic website in support of veterans. Upon arrival at Durham4Vets.org, visitors are greeted by press clippings regarding veterans’ issues, followed by Grant Humes’ reasons for seeking office and a bit about his work history. Clicking the petition displays a form to collect personal information, requests a $20 contribution toward the veterans awareness campaign and support for “sound National Policy” — although there is no petition. In the same navigation bar clicking the “donate” option will cause a different box to appear; this time displaying the candidate’s Liberal Party of Canada donation page pertaining to the by-election. 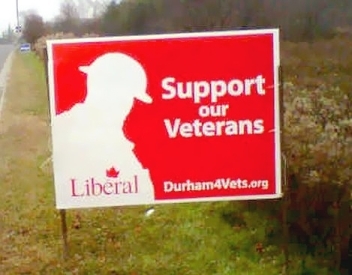 StopTheCruelty.org and Durham4Vets.org are collecting funds through Liberal party mechanisms in the meantime. Whether a by-election campaign or public awareness for cherished issues, this confusion could result in consequences for those who are unable to tell the difference. The timing of a federal election coinciding with the candidate’s project is reported to be incidental, but surely they should be kept apart for the public to perceive ethics in politics.